If you have trouble taking your practice game to competition and under perform in games, your mental game might be the culprit! You might have a ton of physical talent and perform great in practice, but if you can’t get the job done when it counts, something is missing and the problem is an inferior mental game–not talent or motivation. Lack full confidence in your skills when you step on the field as if your game disappears at game time? Make more mental or physical errors during scrimmages and games than during regular practice? Worry or panic when your performance during the pregame warm-up was not perfect? Lose composure easily after you make your first error of the game? Feel embarrassed after striking out and carry this with you for longer than one inning? Worry about letting down the team if you screw up on defense or don’t produce on offense? Have inconsistent performance from game to game because you fail to mentally prepare during the pregame warm up? Rocket Your Mental Toughness for Baseball or Softball With 8 Step-by-Step Lessons! How to fuel your confidence prior to games instead of leaving it to chance. How to overcome outcome expectations that cause you to lose confidence or become frustrated when you under perform. How to refocus quickly when you become distracted during practice or a game. How to trust in your skills in a game–the same skills you practice every day but can’t apply to games. How to stay composed after you make mistakes or strike out and now let it unravel your entire game. How to develop pre-pitch routines for every position to help you mentally be ready every play. How these five simple pregame mental prep steps can help you play with greater consistency from game to game. And of course, mental game skills for your game will not only help you perform well, they can be applied to other areas of your life, such as school, work, and relationships! Get a Sample-Download a Free Bonus! 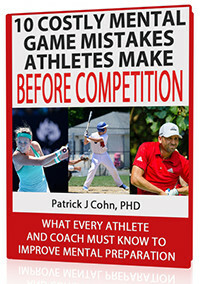 Download Pregame Tips For Coaches and Parents – FREE! We want to help as many athletes as possible. That is why we are giving you Pregame Tips For Parents and Coaches – absolutely free! This bonus provides sports parents and coaches with tips to help athletes feel more confident prior to games. Download this bonus now, no obligation! Working with some of the top athletes in the world including professional baseball players, PGA Tour winners, and NASCAR winners on techniques to improve confidence, focus, and composure for sports. Interviewing many top mental coaches in the world including Ken Ravizza, Robert Nideffer, Tim Gallwey, and Tom Hanson to uncover the strategies, techniques and skills they use to help professional athletes reach peak performance. Authoring and producing an extensive library of sports psychology books, videos, audio programs and training seminars. Visit our sports psychology CD proshop for more details. Earning a Ph.D. in Sports Psychology from the University of Virginia, having published more journal articles than any other students at the time. Owning and operating two leading online mental training websites with hundreds of current members who are reaping the rewards mental game coaching brings to their performance. Owner of Baseball Mental Game Tips website where I share mental game tips, articles, and videos for baseball and softball players and coaches. Tap into my 20 plus years of knowledge and mental game experience so you can improve your mental preparation and mental game skills. My new mental training program uses proven and tested mental game strategies that help you uncover mental game weaknesses and build consistency through specific mental training strategies. If you leave your mental game to chance and just “work harder,” you won’t tame the demons in your mind that hold back your performance. Don’t Leave Confidence to Chance! Fuel Your Confidence Now! How would you perform if you played with higher confidence in your ability, greater composure after mistakes, and trust in your skills under pressure? You can learn how to have stable self-confidence (practice and drills are not the only methods to develop confidence). It’s not hard or impossible to achieve. I help athletes reach their goals everyday and you too can learn the same strategies I teach to my students who pay me well over $1200 per day for personal one-on-one coaching. Get The Mental Edge For Athletic Success Today! What’s Included in the CD Program? “The Mental Edge for Baseball and Softball Players” program consists of 8 workbook lessons and 8 audio programs that that guide you through the workbook. Session Objective–The outcome you want to achieve. What You Need to Know–An introduction to the lesson. Workbook Exercises–The daily confidence exercise you’ll complete. Lesson Action Plans–How to apply the lesson to your practices and games. Post-game Assessment–Questions to check your mental game related to the daily lesson. OUR PROGRAM! YOURS FREE TO KEEP! You’ll Immediately download over $150 worth of FREE bonuses after you complete your order. You get all of these bonuses for just trying our new program! Keep the bonuses even if you choose to return the program for a full refund. Dr. Ken Ravizza, former professor of Applied Sport Psychology at the California State University at Fullerton, discusses with Dr. Cohn his approach to mental training. We talk about what’s needed to find that passion for what you are doing as an athlete (a $25 value). Dr. Tom Hanson, the author of “Heads-Up Baseball: Playing the Game One Pitch at a Time” and former full-time Performance Enhancement director for the New York Yankees, discusses his approach to mental training. Dr. Hanson speaks about his “tapping” technique and its uses (a $25 value). When learning mental game strategies, you first have to understand the concepts such as how to focus, what you need to focus on, and how to refocus when distracted. Print this e-book to help your players learn how to improve concentration using these practice drills (a $30 value). As your players practice more and achieve greater success, expectations can also elevate to the point of harming their confidence. If they don’t reach their own expectations, confidence can take a blow especially when they begin to have self-doubt. Print this e-book to help your players understand the relationship between confidence and expectations (a $30 value). Athletes must apply what they learn in the program to be successful. A pregame routine is the perfect way to apply what you learn. This cheat-sheet guide summarizes the top mental preparation strategies and tells you exactly how to mentally prepare for game. You can modify the guide to fit your athletic needs (a $30 value). What should you, as a parent or coach, say and do just before competition to help athletes get into a confident mindset? Learn how you can reinforce our mental strategies so you’re part of the solution and not part of the problem! Help your ball player play with confidence (a $20 value). How well do you support your athlete’s mental game? Take the sports parent test to assess how well you are supporting your athlete and their mental game. See how you can improve your sports parenting skills (a $20 value). How Much is the Program, Dr. Cohn? Our new program retails at $249.00. For a smaller cost of a new ball equipment, you can enjoy higher confidence. AND you’ll learn the key mental skills that help you impart self-confidence instead of take it away. Remember: We are trying to keep the cost down so we are offering this as a DIGITAL DOWNLOAD ONLY, but if you are a coach, this makes it easier to share the program with your entire team! I stand by my work and reputation as a leading mental game coach and professional. 30 years of research, experience, and work goes into every program we release. If you are not completely satisfied with “The Mental Edge For Baseball And Softball Players” program, you can return it (within 30 days) for a full refund, no questions asked! Coaches: I’m happy to work with your team in person, but most teams can’t afford my fees of $2500 and up for a live seminar. Instead, get our new program today and you’ll have the material to conduct 8-10 mental training workshops for a fraction of the price! The easiest and most efficient way is to place your order online today and download your program and 7 bonuses after you complete your order. Click Here to Order Now. A 125-page PDF workbook broken into 8 sessions to guide you through my mental toughness sessions (PDF Workbook value: $89.00). 8 Post-Game Assessment worksheets to help assess how you are doing and make needed adjustments with your mental game (Assessments value: $160.00). Over $150 in FREE bonus programs — including interviews with Dr. Ken Ravizza and Dr. Tom Hanson. Thank you very much for reading about “The Mental Edge For Baseball And Softball Players.” I know this will help you or your athletes perform with greater focus, maintain ultimate confidence, and stay composed after making errors because I’ve tested these same strategies with my personal coaching students. P.S. I stand by my work and reputation as a leading mental game coach and professional. If you are not completely satisfied with “The Mental Edge For Baseball And Softball Players” program, you can return it (within 30 days) for a full refund, no questions asked!